I've always loved the look of gingerbread men. This year I finally made a fun gingerbread man wreath, but let me tell you why. For years and years my Mom had a Merry Christmas sign that was made from gingerbread men strung on some red ribbon with some sweet beads as accents. It was a staple in our Christmas decorations and we all loved it. We looked forward to hanging it up and often fought about who got to do the honors. Now I will admit I wasn't entirely sure I wanted to make a wreath with this cute gingerbread. I mean they are so stinking cute but since she only gave me 6 gingerbread men, I was a bit limited on what I could do. I couldn't exactly make a "Merry Christmas" sign with only 6 gingerbread men. After a bit of research and some Pinterest inspiration, I decided to make a simple wreath and LOVE how it turned out. It fits perfectly on my door and each gingerbread man is a little different. It would be really cute to make them into little women as well, but I wasn't that cool. I was just lucky to finally get them out of my sewing room and up for the holiday season!! Paint gingerbread men with brown paint. You could do one color of brown or use different shades for a different look. Use the white paint pen to add the eyes, nose, mouth, and "decorations". You can use zig-zag lines, straight lines, curves, whatever you'd like. Make each gingerbread man a little different for some interest. You could even get the kids involved in decorating their own gingerbread man. Once your gingerbread are dry, place 3 of them together at the feet. Glue the feet together using the E6000 glue. Just take my word for it. I've hot glued them before and they just come apart in storage. Use a heavy duty glue. Repeat this with the other 3 gingerbread men. No place one set of 3 gingerbread over the other set. Glue the gingerbread in place really well. I placed the glue on the bottom layer and then set the top layer over it just so I got the right amount of glue in the right spot. Allow to dry. 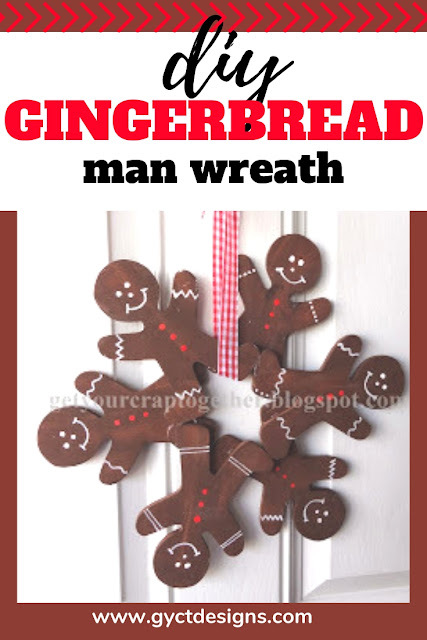 Take some festive ribbon and cut a long piece that can go through and around the gingerbread man wreath. You'll want it long enough that you can tie a cute bow at the top.